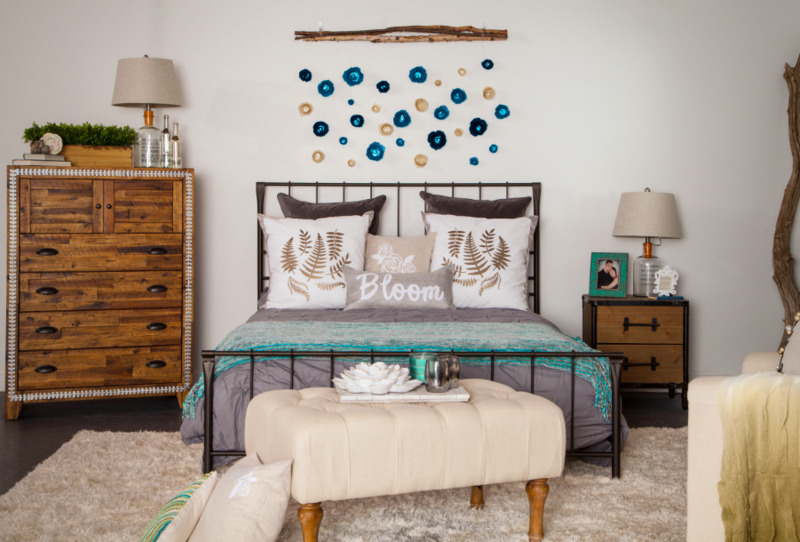 Hey guys, I’m Heather from WhipperBerry and I’m thrilled to be here on the Cricut blog today to share with you my fun experience working with some crazy talented stylists along with Hayneedle and Cricut to create a dream romantic, rustic industrial bedroom. My first project for the room was dressing up the beautiful Belham Living Nala Arm Chair draped with Surya Toya Ombre Throw Blanket from Hayneedle then customized the chair with a beautiful wreath pillow created for this space with the Cricut Faux Leather and some craft pearls. The chair and the throw were beautiful on their own but, when you add that custom pillow it takes your space from wow to WOWZA! You get to put YOUR signature on the space. 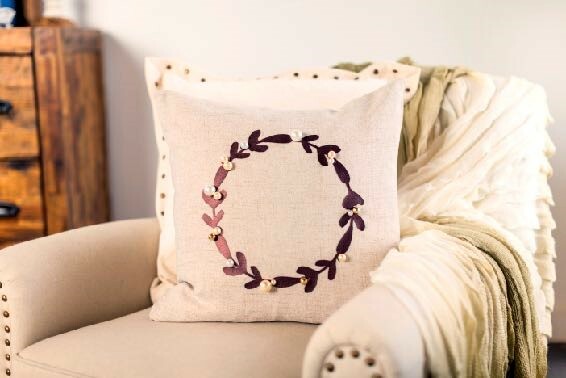 If you would like to make one of your own, visit the Cricut Design Space and select the WhipperBerry Wreath Pillow. Cut your Faux Leather to the size of your pillow then iron on some Heat’n Bond onto the WRONG SIDE of the Faux Leather. Place the Faux Leather FACE SIDE DOWN on the cutting mat and cut out your wreath. PRO TIP • Always place your Faux Leather FACE SIDE DOWN when you place it on the Cricut Cutting Mat. The Faux Leather will come away from the cutting mat easier that way. Make sure you select the Mirror Image (for iron-on) check box on the review screen so that it will cut properly. Iron the wreath onto your pillow cover and either stitch on your pearls in place of the berries OR glue them on with a strong adhesive glue. I thought it was perfect for our space. 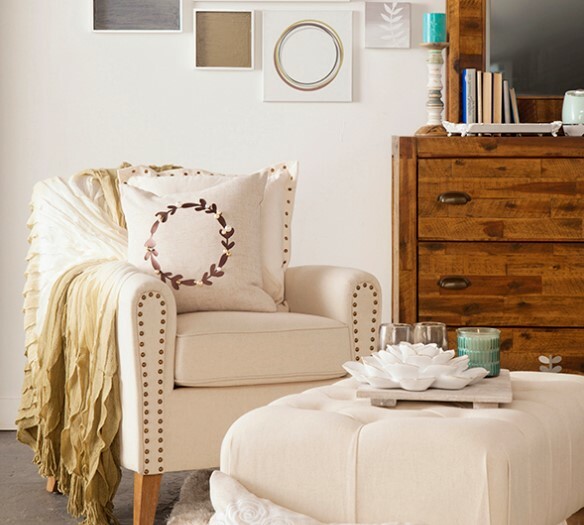 I used a picture frame like this one from Hayneedle as the canvas for this wall art piece. I took the back off of the frame and painted the frame back with some fabulous paints from Colorhouse to create some texture and add some color to the backing before I adhered the Cricut Stainless Adhesive Foil. I didn’t bother painting the entire back of the frame because I knew that the frame was going to cover some of the edge of the backing. I painted it with a base color, then lightly brushed on a little bit off a contrasting color to add some dimension then I set it aside to dry. Next, I cut out the Adhesive Foil with the Willdflower Wall Art that I created in the Cricut Design Space. Once I weeded the excess foil, covered it with my favorite Cricut Transfer Tape (THE BEST EVER!!) and centered it on my board and then hinged it. 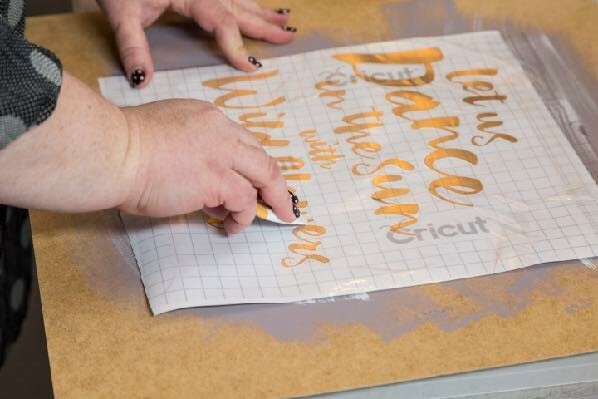 PRO TIP • When adhering vinyl or foil to a surface with transfer tape, use a piece of painters tape or even a strip of the transfer tape (at least an inch wide) the length of your transfer to create a “hinge” at the top of your design. Then using the “hinge” flip up the design, remove the vinyl or foil backing and carefully lay down the transfer tape/foil onto your surface. The tape “hinge” will keep your design exactly where you would like it with out any trouble at all! 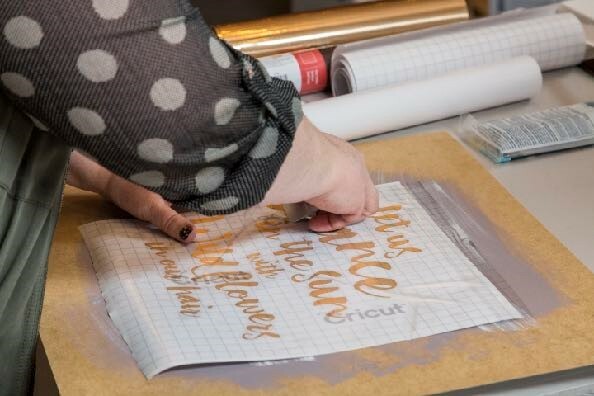 Once I laid down my adhesive foil, I made sure to press it down using my new favorite tool, the Cricut XL Scrapper. Then I removed the transfer tape, replace the back onto the frame and voilá… You now have a beautiful piece of wall art! To complete the gallery wall, I paired it with the Fern Wall Art from Idieh Design, the Geometric Wall Art from Love Create Celebrate and then we painted some small trays to add a pop of color to the wall. I thought it looked fabulous all together. I truly wanted to curl up on that cozy chair and read a great book in our warm space. 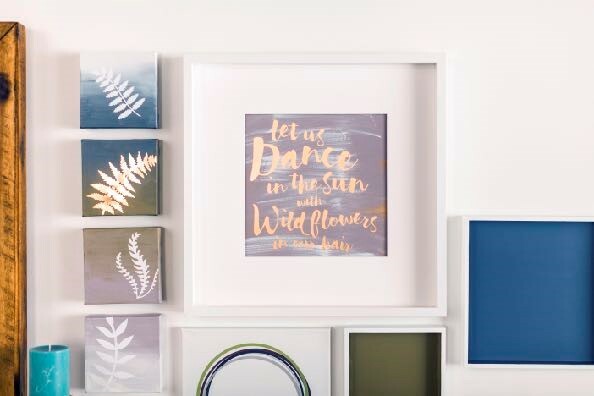 I hope we’ve inspired you to put YOUR signature on your home with Cricut. Make sure to take a look at the rest of the designs from this bedroom dress-up from Jennifer Rizzo Design & The Crafty Blog Stalker AND, watch our fun video on the Cricut Blog! When you’re finished with all of that, come on over to WhipperBerry and say HELLO! I will be sharing all kinds of Cricut projects along with more tips & tricks to make sure your projects turn out great. Love love love both of these. I used the faux leather and the foil on Christmas presents last year (sssshhhh on my “other” digital cutting machine b/c I haven’t been able to buy a new one yet) and adore both of them. The foils are the BEST thing ever. Love them. And the faux leather is so rich and amazing. Since your have successfully completed a foil adhesive project, I have a question. Are you using a deep cut blase and the string grip mat? I have failed at multiple attempts using the product! Please share your secrets! Wow, I’ve had some Cricut Leather (got in a Mystery Box) and purchased some adhesive foil (it is so pretty) and had no idea what to do or use them for. I too need to know the blade, mat and depth to use. Now I know what I can do with the foil and leather, Problem solved!!! © 2019 Cricut. All rights reserved. © 2019 Cricut. All rights reserved. Cricut. All rights reserved.